It was a rough few decades, but Rust Belt stalwart Pittsburgh seems to be pulling ahead. This former steel town, its name once synonymous with industrial decline, has rebuilt its economy largely around higher education. It recently attracted a Google corporate office. In fact, employment has never been higher in Steelers’ Nation, reports Jon Geeting at Network blog Keystone Politics. But there is a looming crisis in transportation and it has the potential to knock this resurgent city off its financial stride. On September 2, without state intervention, the local transit system is facing catastrophic 35 percent system-wide cuts. In order to avoid service reductions, the Tribune reports, 25 percent concessions are needed from Port Authority’s unions and management, along with a $35 million infusion from the state. Pennsylvania Governor Tom Corbett has indicated a willingness to help, but says he wants to see local expenses reduced first. 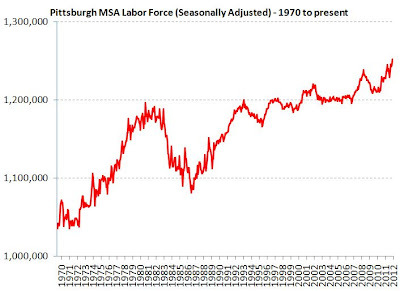 Politicians would ideally be asking themselves what Pittsburgh might be doing right to have all-time peak employment, and what the state could be doing to complement growth in the Pittsburgh MSA and make it possible for even more people and businesses to locate there. Geeting reports the service reductions are expected to reduce daily transit ridership by 19 percent, roughly 40,000 passengers. That would add more than 23,000 vehicles to the roads. Meanwhile a recent study found downtown Pittsburgh only has about 3,800 additional available parking spaces daily. That’s going to add a ton of traffic congestion downtown that just doesn’t have to be there. That congestion is not just going to be a waste of people’s time and a drag on productivity. It’s actually going to limit how many more daytime workers the city can add downtown, and how much more commercial and residential development there can be. Elsewhere on the Network today: PubliCola reports a Seattle pol has suggested evaluating the carbon impact of every city project before deciding where to invest public money. Bike Portland outlines a local plan to smooth potholes and help local charities at the same time. And BikeSD gladly announces that the City of San Diego is saying goodbye to its bike licensing requirement.